Logocentrism, as a twentieth century neologism commonly associated with the philosophy of Jacques Derrida (1930-2004), represents a structuralist philosophical method that prizes rational thinking and the existence of a universal language. Logocentric characteristics often manifest themselves in binary oppositions and the idealization of a single unified truth. They are ingrained in our culture and daily life through hierarchies established by ideologies that were developed around the superiority of a single centre such as the Christian logos of God, the privileged position of the male, the author’s text (part of this year’s TaPRA Performer Training Working Group discussion). Logocentrism is also reflected in the traditionally established binaries between theory and practice, academic and conservatoire educational environments. Receiving this year’s TaPRA discussions, it seems to me that there is space for further integration and flexible understanding of theory-practice or practice-theory interconnection in conservatoire actor-training contexts. I suggest that this openness could become beneficial for a fuller perception of currently used actor-training pedagogies and an ongoing response to actors’ multiple and constantly changing needs within the contemporary diverse acting world. The TaPRA conference has been offering an invaluable space for the gradual growing of the active interconnection between theoretical and practice research. This emergent new research direction, particularly related to Robin Nelson’s practice-as-research methodology (2006, 2013) which I used as map for my PhD research, is the theme of the TaPRA associated volume Research Methods in Theatre and Performance (Kershaw and Nicholson 2011). It is also the subject of discussion in academic journals such as Theatre, Dance and Performance Training as well as this blog version which generously offers access for communication of immediate thoughts. All this activity that represents a paradigm shift has been the only reason I personally enacted my own research as its practical shaping and pedagogical development resides within the relational conservatoire actor-training environment. Moreover, my participation in the Performer Training Working Group due to my pedagogical focus, has been giving me the opportunity to test out as well as to challenge possible ways of disseminating the praxical nature of my research in conferences. Thus, whereas my first TaPRA sharing in 2014 was a film-lecture on the documentation of my PaR, this year I aimed at communicating the very emergent and intersubjective intentions of my practice through present group experience. In response to this year’s theme, I proposed the workshop From each actor’s embodied logos to the text: a new somatic actor-training approach. A five-minute introduction which I found necessary in order to contextualise my conservatoire background and research focus preceded the workshop. I outlined my theoretical response to what I identified above as problematic logocentrism in actor training, through the original notion of each actor’s embodied logos. Embodied logos suggests a further development of Merleau-Ponty’s phenomenological understanding of logos as flesh, adding the importance of individuality to the philosopher’s perception of logos as embodied and intersubjective experience. I connected the notion to the practical ground of my research which proposes a new for actor-training modification of Cohen’s somatic process of embodiment and human movement development towards each actor’s creative process, the embodiment of the character and the text. Due to the short workshop timeframe (around 25 minutes after the introduction), I tried to make clear that I would attempt the sharing of instances within the actor-mover’s preparation towards the first expression of the text. In order to ‘hold’ the understanding of this developmental journey, I used the narrative of three sequential breathing steps: lung breathing, cellular breathing and belly-button breathing or navel radiation. The actual embodiment of the given text was introduced in this workshop in the cellular breathing step, while lung breathing was used as arriving and navel radiation as integrative steps. My overall underlying intention was a brief experience of acting as intersubjective relation between self and space, self and other, self and text through the support of the other combined with the ongoing relational awareness of one’s embodied self through the integration between part and whole. I first introduced the gradual resonance to one’s breathing awareness through a walking-based grounding. I identified walking as a daily but at the same time complicated movement that can bring the actor-mover in relation to grounding within the space. Following a grounding down to up invitation through the support of the skeletal system and the space in between the joints, the participants reached their ribcages and present lung breathing experiences without further technical instructions (see image 1). Then I suggested an openness to the others in the space in combination with a lung to lung or breathing to breathing meeting with a partner in order to explore relational vibration, movement and sounding through the support of the other (see image 2). As walking, breathing and contact through breathing are common ground in many embodied actor-training practices such as Grotowski-based processes, I introduced the potential emergence of familiar embodied resonances to the expert researchers and practitioners that comprised the group. This clarification was rooted within my awareness that my practice is situated within a long tradition of movement-based approaches which share the common objective of supporting actors’ embodied expressions. Nevertheless, the suggested differences, as part of my pedagogical response to logocentric problematics in actors’ learning processes, are rooted in the openness to actors’ relational explorations and multiple perceptions based on what I identify as fluid structures and my dynamic role as trainer-witness. Most importantly, the originality of my practice lies in the way I modify the BMC®-informed ontogenetic metaphor in order to communicate actor training as ongoing, intersubjective and at the same time uniquely individual experience; as an environment of mutual sensitivity and responsibility between actors, each actor and the educator. Cohen’s ontogenetic metaphor is underpinned by the moving and flexible image of the cell which can also metaphorically represent the intended porosity between theory and practice in combination with poststructuralist languages in contemporary practice-based research. Within this understanding I introduced the transition to the embodiment of the text through moments of cellular contact exploration. After an individual transition from the lung breathing to the awareness of whole-body breathing through the cellular contact with the space, the participants were invited once more to meet a partner maintaining the same cellular awareness. It was the only moment within the workshop I asked the actor-movers to turn towards me as I indicated the basic intentions of the exploration with the help of a partner. It was important for me to do so in order to identify some subtle nuances in the suggested dynamics while at the same time I did not mean to give a detailed introduction. I outline below the exploration’s basic qualities in present tense. The process is developed between the actor-mover and the actor-witness and it is an active dialogue that focuses on the support of the actor-mover’s exploration through the shared visualization of the cellular metaphor. The actor-witness places her whole palm on the actor-mover’s body only in order to give her a very subtle tactile impulse (see image 3). The actor-witness’s intention is neither to direct nor to push unless the actor-mover indicates this gradual development in her exploration. The actor-witness is prompted not to rush in order to give her partner time to fully absorb new impulses without overwhelming her. The actor-mover receives the impulse and focuses on the point of contact as if her movement, voicing and eventually the words of the text ‘sound through the contacted cells’ of her body. The given text was printed on papers I had spread on the floor, in large bold letters, intentionally only in lower cases and without punctuation: ‘where words are scarce they are seldom spent in vain for they breathe truth that breathe their words in pain’ (Richard II, Act 2, Scene 1). The participants were invited to use it freely during the cellular contact exploration. As a concluding integration and being aware of my responsibility to complete the workshop in the given timeslot, I invited the participants to the circle for individual navel radiation expressions within the group (see image 4). Through this group experience as a conclusion of a dense experiential journey we made the transition to questions and the final reflection of all three days. Part of my own instant inner reflection, which I did not have the chance to share with the group, concerned my challenging choice to take the participants through a dense process instead of focusing for instance only on the cellular embodiment of the text. Another thought focused on the choice of the text as part of our overall discussion. The Shakespearean lines were suggested for two reasons. The one simple reason, that I briefly mentioned in the workshop’s introduction, was the relation between breath and words indicated in the poetic text. The second reason is my personal attempt to identify how I could bring the twenty-first century acting students closer to Shakespeare’s text as the use of his plays is common ground within UK-based conservatoire actor training. My suggested approach is embodied and experiential, it is shaped in order to support the emergence of each actor’s own rhythm and multiple individual interpretations. I should clarify that this is only one way into the classical text and by no means does it negate more traditionally-oriented processes. Instead, it complements the actors’ potentialities while it belongs to contemporary revisions of Artaudian approaches to the author’s text that have been embraced through different forms in the work of practitioners such as Grotowski, Barba and Staniewski. I am glad that Konstantinos Thomaidis, one of the group’s convenors, during the discussion that followed used the example of the recent Song of the Goat Theatre production Crazy God (July 2016, dir. Grzegorz Bral) as a modern ‘reading’ of Shakespeare’s Hamlet through physicality and musicality. In the general reflection he also highlighted that modern theatre practices eventually suggest alternative ways of text-based work instead of negating it. ‘Echoing’ in a way the modern openness indicated in Thomaidis’ observations, my shared overall reflection focused on my ongoing growing in the group as well as on the appreciation of the given space for the development of mutually respected discussions. My current written reflection complements the spoken one focusing on the suggestion that there is space for more praxical understanding within actor-training conservatoires. It also further interrogates the most possibly productive ways of disseminating pedagogically-oriented praxis before, during and after conferences according to context-specific practicalities and in response to ongoing logocentric challenges of dualistic binaries such as theory and practice, academic and praxical research. Cohen-Bainbridge, B. (2012) Sensing, Feeling, and Action: The Experiential Anatomy of Body-Mind Centering, Northampton, Contact Editions. Derrida, J. ( 1997) Of Grammatology (trans. G. C. Spivak), Baltimore, John Hopkins University Press. 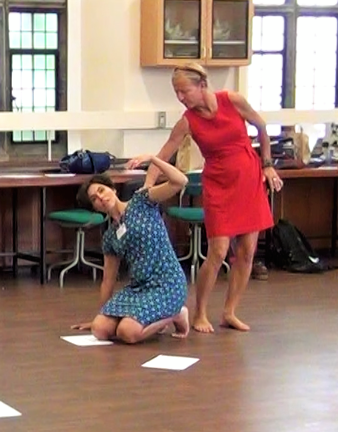 Kapadocha, C. (2016) Being an actor / becoming a trainer: the embodied logos of intersubjective experience in a somatic acting process, PhD, Royal Central School of Speech and Drama, University of London. Kershaw, B. and Nicholson, H. (2011) Research methods in theatre and performance, Edinburgh, Edinburgh University Press. Nelson, R. (2006) ‘Practice-as-research and the Problem of Knowledge’, Performance Research: A Journal of the Performing Arts, Vol. 11, No. 4: 105-116. Nelson, R. (2013) Practice as Research in the Arts: Principles, Protocols, Pedagogies, Resistances, Hampshire, Palgrave Macmillan. Schechner, R. (1973) Environmental Theatre, New York, Hawthorn. Stenstad, G. (1993) ‘Merleau-Ponty’s Logos: The Sens-ing of the Flesh’, Philosophy Today, Vol. 37, No. 1:52-61. Nair, S. (2007) Restoration of Breath: Consciousness and Performance, Amsterdam, Rodopi. GNT stands for Greek National Theatre. GNT Drama School is the Greek equivalent of RADA in the UK and it is aligned to the National Theatre in Athens. IBMT stands for Integrative Bodywork and Movement Therapy, RSME for Registered Somatic Movement Educator and RCSSD for Royal Central School of Speech and Drama. TaPRA stands for The Theatre and Performance Research Association. Research that develops upon this dynamic interconnection of theory and practice. Despite Hartley’s therapeutic focus, throughout my training I concentrated on the interrelation between the explored somatic principles and my educational-creative pedagogy. I also clarify my pedagogic orientation by being registered as somatic movement educator (RSME) instead of therapist in the International Somatic Movement Education & Therapy Association (ISMETA). A most indicative example that represents both stances is the mechanisation and unification of all actors’ bodies implied in the use of the instrument metaphor. As Richard Schechner pointed out towards the end of the twentieth century: ‘Your body is not your “instrument”, your body is you’ (1973: 145). Derrida’s definition of logocentrism is summarized in ‘the exigent, powerful, systematic, and irrepressible desire’ for a transcedental signified (1997:49). For an extended version of my discussion on dualism and universalism as problematic logocentrics and how they are present in contemporary actor-training discourses through the influence of the way Konstantin Stanislavksi (1863-1938) inevitably re-introduced them in the first formal actor-training approach in Europe, see Kapadocha 2016. For the workshop abstract, see TaPRA Conference 2016 Abstracts and Biographies, p. 93. My description of Merleau-Ponty’s corporeal understanding of logos as flesh in based upon Gail Stenstad’s choice of words in her article ‘Merleau-Ponty’s Logos: The Sens-ing of Flesh’ (1993: 52-61). For a brief description of Cohen’s process of embodiment see Cohen 2012: 157. For Cohen’s approach to what she defines as Development Movement Patterns (DMP) or Basic Neurocellular Patters (BNP) see Cohen 2012: 5, 16-17. I have to clarify that even though I identify these processes and terms in order to acknowledge the ground of my practice, they do not represent my own use of language and somatic acting explorations. Lung breathing represents the attunement to one’s actual breath. Cellular breathing suggests the embodiment of cellular metaphor and the exploration of one’s embodied self as a breathing whole. Finally, belly-button breathing or navel radiation brings into relation one’s physical extremities (head-tail-hands-feet) around the suggested ‘centre’ of the belly-button area. In general I do not believe in the existence of one specific embodied ‘centre’ and I take the actors through the experience of multiple and ever changing suggested ‘centres’ in order them to develop a response to their own explorations. I very briefly integrated the experiential perception of each participant’s skeletal system as BMC®-informed expression in acting through the embodiment of body systems such as bones, muscles and organs is also part of my teaching. For an overview on the use of breath in actor training through intercultural philosophical discussion see Nair 2007. This entry was posted in Comebacks and tagged actor training, BMC®/IBMT, embodied logos, logocentrism, praxis, Somatic Acting Process®, somatic movement practices by Christina Kapadocha. Bookmark the permalink.